A male mongoose lemur (Eulemur mongoz) Credit: Wikipedia. 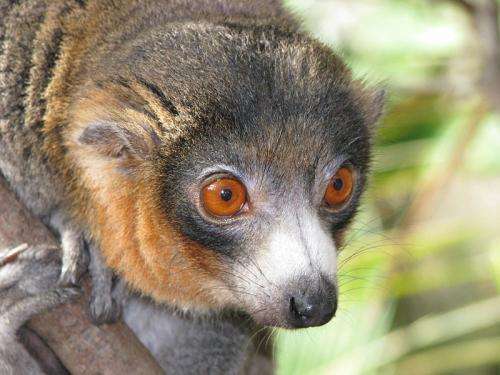 Food-finding tests in five lemur species show that fruit-eaters may have better spatial memory than lemurs with a more varied diet. The results support the idea that relying on foods that are seasonally available and far-flung gives a competitive edge to individuals with certain cognitive abilities—such as remembering where the goodies are. In a study appearing in the journal Animal Cognition, researchers Alexandra Rosati at Yale University and Kerri Rodriguez and Brian Hare of Duke compared spatial memory skills across five species of lemurs living in captivity at the Duke Lemur Center—fruit-eating red-ruffed and black-and-white ruffed lemurs, leaf-eating Coquerel's sifakas, and ring-tailed and mongoose lemurs that eat a mix of fruit, leaves, seeds, flowers, nectar and insects. A total of 64 animals took part in the studies, which measured their ability to remember the locations of food treats in mazes and boxes. The results are consistent with these species' foraging behavior in the wild, the researchers say, with fruit-eaters doing well and omnivores lagging behind. In the first experiment, the lemurs learned the location of food hidden in one of two arms of a T-shaped maze. A week later, the fruit-eating ruffed lemurs were the only species able to retain and recall the right spot. A second experiment tested whether the lemurs were recalling the exact spot or just remembering the turns they took along the way. First the lemurs learned how to find a piece of food hidden in one wing of a symmetrical cross-shaped maze. Ten minutes later, the lemurs were moved to a new starting position in the maze and released to find their way again. The ruffed lemurs were most likely to set off again to the right spot in the cross-maze, even though they had to take new turns to get there. "Before they might have turned right, but now they had to turn left to get to the same spot," Rosati said. The results suggest that ruffed lemurs primarily rely on a memory of the place, rather than a memory of what turns they took. The other species showed a mix of both strategies. Finally, to better reflect the situations lemurs face when foraging in the wild, a third experiment tested the lemurs' ability to remember multiple locations. In the initial session, a lemur was allowed to explore a room containing eight open boxes, each marked with a distinct visual cue. Half the boxes were baited with food and half were empty. After the lemur learned which boxes contained food and which didn't, all eight boxes were baited with food and covered with lids to keep it from view. Ten minutes later, when each lemur searched the room again, only the ruffed lemurs preferentially searched spots where they found food before. In their native Madagascar, ruffed lemurs' diets can exceed 90% fruit—especially figs. Remembering when and where to find food from one season to the next requires keen spatial skills and good powers of recall. Fruit is only ripe and ready to eat on a given tree for a limited time, and the next fruit-laden tree may be far away in the forest. Coquerel's sifakas eat mostly leaves, which are easier to find and available for more months of the year. And ring-tailed lemurs and mongoose lemurs—who finished in second and third place in many of the memory tests—can grab a snack pretty much anywhere, anytime, Rosati explained. Animals living in captivity don't have to forage for food in the same way they do in the wild, so the differences the experiments found are probably innate, not learned, the researchers said. The study is part of a long history of research aimed at understanding the origins of primate intelligence. The most widely accepted idea is that humans and other primates owe their smarts to the demands of getting along in a group. But far fewer studies have examined the idea that some aspects of primate intelligence arose because they helped the animals deal with other challenges, such as foraging for food. The researchers point out that the most social species in this study—the ring-tailed lemurs—fell in the middle of the pack in terms of spatial memory skills. "Our results suggests that different cognitive skills might evolve for different reasons," Rosati said.